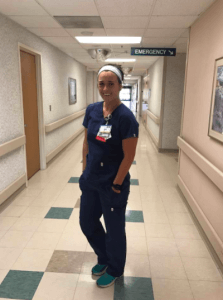 Meet Savanah Case, a hard working, final semester nursing student at MidAmerica Nazarene University in Olathe, Kansas. She shares her nursing school experience and advice for any nursing student just beginning their journey. When you were in your first semester of nursing school, what challenges did you experience? Time management. I started the semester with a planner, but didn’t really fill anything out on my planner… why, I’m not sure. BIG MISTAKE. Between chapters that need to be read, quizzes, tests and assignments, it is really easy to miss something or realize you’ve missed something last second. My advice? Get a planner – a BIG one. Once the syllabi are out for the classes I have that semester I look at the course calendar and write it down in my planner. Test dates, quizzes, reading for every class, etc. That way I can look at what is coming up. Reading. Wow, this one, for me, was truly overwhelming. I learned you have to do the best you can with the time that you have! Reading is important … very important. There is a lot to know as a student nurse and reading to be prepared for class or to take an exam is vital to your grade, as well as your own learning. Professors cannot possibly teach you everything you need to know in the time given, and we cannot possibly read every chapter they assign and still sleep. My philosophy is that some reading is better than none! I can’t tell you a single person that never opened a book during nursing school. Test taking. I am sure, if you are considering nursing school, you have heard that the way we are tested is different from your prerequisites, and if you haven’t heard that yet, here it is. The thing about nursing school questions is that there are typically two correct answers to choose from and two that are obviously wrong. From the two correct answers you have to pick which is more correct. This is an adjustment. What courses or concepts did you find the most exciting throughout nursing school? For me, my favorite classes were pediatrics, labor and delivery, and acute care nursing. These are all topics that I am really interested in. Also, clinical rotations are really exciting and are such good learning experiences. What courses or concepts did you find the most challenging throughout nursing school? All of it – am I allowed to say that? To be really honest, the whole process is a challenge, but in a good way. With each course comes new challenges, concepts and subjects. You will have different professors who teach in different ways. You will also have subjects that are challenging for only you to grasp. Out of all of the courses, I would say medical/surgical nursing and pharmacology are some of the harder classes you will take. I feel like these are pretty common answers to the “most challenging course” question. These classes are very heavy in terms of content and you need to know it. You will be taught and expected to learn a lot of information and it can be overwhelming at times, but take it one day at a time! What advice would you give a new nursing student struggling with a course or concept? First, I would say figure out how you study and learn best, and figure this out early. Some people read all of the chapters in depth to learn the information, some study off of the powerpoints from class and some can simply just listen to professors teach. In my class, there are some people that study best on their own and some that study with a group of two or three people. If you are not understanding a topic, ask for help! How? Get in contact with your professor, talk to your friends about it or schedule a time to meet with a tutor. The worst thing you can do when you don’t understand or are struggling is to keep doing it on your own and hope you figure it out. A lot of books have online resources that give chapter key points and have quizzes that test your knowledge. If your school uses ATI, read the corresponding sections in your ATI book because it gives you all the high points without going as far in depth as your book might. Another tool to use is YouTube, especially if you are more of an auditory/visual learner. There are so many videos you can watch on a variety of topics, just make sure the information they’re providing is reliable! If you could share any advice with a new nursing student, what would you tell them? At some points you are going to feel like you don’t know anything or that all of this seems too hard. I don’t say this to scare you, but to let you know that you are not alone in this. I cannot tell you one person I have met that has gone through nursing school and hasn’t said it was one of the most challenging things they have done. The challenges make you better, as a nurse, as a person and for your patients. It will be over before you know it, you can do it! Looking for more nursing school advice? We’ve got you covered! Check out Part One: What End-of-Program Nursing Students Wish They Had Known at the Admissions Process and Part Three: What End-of-Program Nursing Students Wish They Had Known when Finishing Nursing School.